Product prices and availability are accurate as of 2019-04-11 10:33:33 EDT and are subject to change. Any price and availability information displayed on http://www.amazon.com/ at the time of purchase will apply to the purchase of this product. 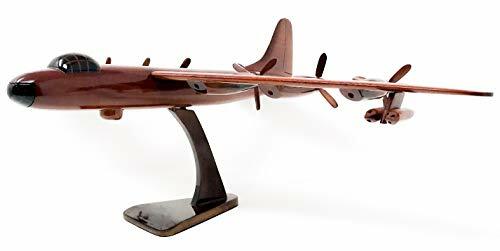 This B-36 is a Beautifully handcrafted aircraft model made out of solid Mahogany wood. All hand made, hand etched, sanded, and polished to a high gloss finish to reveal the rich wood grains. 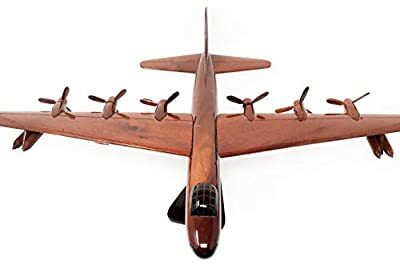 The Convair B-36 "Peacemaker" is a strategic bomber built by Convair and operated solely by the United States Air Force (USAF) from 1949 to 1959. The B-36 was the first bomber capable of delivering any of the nuclear weapons in the U.S. arsenal from inside its four bomb bays without aircraft modifications. With a range of 10,000 mi (16,000 km) and a maximum payload of 87,200 lb (39,600 kg), the B-36 was capable of intercontinental flight without refuelling. This model is a Quality piece of wood work for display in any setting. This can be the centerpiece of conversation at your next gathering, or a silent appreciation for any art lover.